Member of the Asteraceae family, which is one of the largest families of flowering plants on the planet (Encyclopedia Britannica 2014). The genus name Madia comes from Chilean dissent (Sonoma 2013). Native species to the upper northwest coastal regions of the United States (Krimmel and Pearse 2013), living within a range from 0 - 2590 meters in altitude (Calflora 2014). 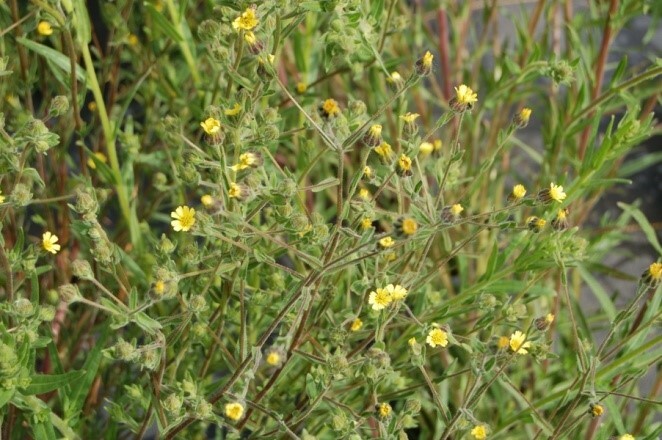 Madia gracilis is able to grow in regions of dry and less nutritious soils, making it unlike many other plants in the world (Krimmel and Pearse 2013). Because of the ability to live in poor soil conditions, this plant is used in many ecosystem restoration projects (Ross 2012). Grows anywhere between 4-40 inches in hight at full maturity (Ross 2012). Uses glandular trichomes to secrete a sticky substance that protects itself from potential insect predators (Krimmel and Pearse 2013). Creates hard seeds to be distributed throughout the environment and develope into new plants (Campbell et. al. 2008). The seeds are very nutritious and are used as a food source by many different species, including humans (Sonoma 2013, Ross 2012). The brightly colored array of leaves of the Madia gracilis are crucial to attracting pollinators to the plant (Celedón-Neghme 2006).